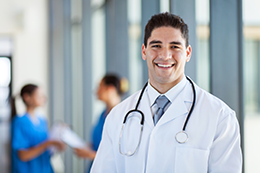 What is an Otolaryngologist Anyway? Otolaryngologists are physicians who specialize in medicine, surgery and treatment of the ear, nose, throat and related structures of the head and neck. These specialists differ from many physicians in that they are trained in both medicine and surgery. Otolaryngologists complete up to 15 years of college and post-graduate training before becoming board certified and beginning practice. They are commonly referred to as ENT physicians, which stands for Ear, Nose, Throat. Care of the nasal cavity and sinuses is one of the primary skills of otolaryngologists. A few of the problems in the nasal area include allergies, sinus issues, polyps, and nasal obstruction due to a deviated septum. Bacterial ear infections can be treated with antibiotics, while most viral ear infections resolve on their own. If ear infections or middle ear fluid becomes chronic, “tubes” can be inserted in the ear drum to prevent additional problems such as hearing loss, speech problems and academic or behavioral issues. The “tubes” are tiny cylinders placed through the ear drum by an ENT specialist (otolaryngologist) to allow air into the middle ear. They are also known as tympanostomy tubes, myringotomy tubes, ventilation tubes, or PE (pressure equalization) tubes. Ear tubes are inserted through an outpatient surgical procedure that lasts less than 15 minutes, and patients recover very quickly. This is an extremely common and safe procedure with few complications. 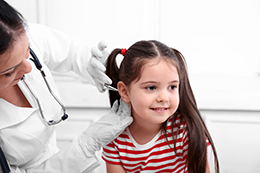 If your child has persistent ear infections, have him/her evaluated by our ENT physicians in Hagerstown to determine if ear tube insertion would help. 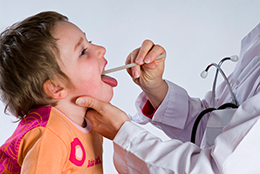 Does your child have symptoms of an Ear Nose & Throat problem? Is someone in your family suffering with chronic sore throats and tonsillitis? The primary cause of sore throats is infection from viruses or bacteria, but allergies and sinus infections can also play a part. Tonsillitis is infection and inflammation of the tonsils, the two round lumps in the back of the throat that you can see. Adenoids are high in the throat behind the nose and the roof of the mouth and are not readily visible. Tonsils and adenoids are similar to the lymph nodes found in the neck, groin, and armpits which serve as the first line of defense in your immune system. As the lymph tissue filters and responds to infectious agents entering your mouth and nose, it may also become infected. When tonsil or adenoid enlargement causes nasal obstruction, difficulty breathing or swallowing, sleep disturbance, chronic sore throat or chronic ear infections, an evaluation by our ENT specialists at Cumberland Valley ENT can determine the best treatment, including consideration of tonsillectomy and/or adenoidectomy. Have you had the unsettling sense that you, or your surroundings, are spinning when you are actually still? This sensation is often caused by an inner ear condition called Benign Paroxysmal Positional Vertigo (BPPV). BPPV can be triggered by specific movements or positions of your head and usually comes on suddenly. The feeling of spinning from BPPV may be intense and disorienting, but it is usually short-lived and is not life-threatening. BPPV is very common, and more common in older people. Rocklike crystals of calcium carbonate are a normal part of your inner ear associated with balance and body motion. BPPV is caused when the crystals are dislodged from their normal place in the center of the inner ear. When you move or change head or body position, the dislodged crystals float and trigger sensors in the wrong parts of the inner ear that tell your brain that you are physically spinning. Nausea, loss of balance, disorientation and dizziness may also occur. Movements as simple as rolling over in bed, sitting up, looking up, bending over or reaching can cause an episode of BPPV in some people. There is no consistent reason for occurrences, although it may be associated with other inner ear issues, trauma, migraine, and some illnesses. If you have experienced any symptoms of vertigo, please schedule a consultation with one of our Cumberland Valley ENT specialists so that we can help. Cumberland Valley ENT can help diagnose and treat your Ear Nose and Throat issues. Call us today or send a message to set up your appointment.